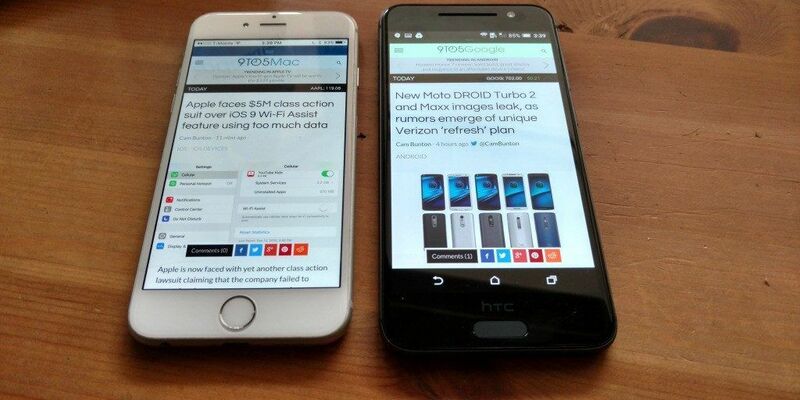 HTC One A9 first look: An iPhone doubletake or incredible phone in its own right? I’ve had the HTC One A9 in my hands for a few days but didn’t want to give my initial thoughts until the Taiwanese smartphone maker pushed an update fix to the Android 6.0 phones yesterday. I’ll get the obvious out of the way right off the bat: Yes, for better or worse, it looks like an iPhone 6. Sure, HTC invented the antenna strips with the M7 a few years ago and there are significant differences like the size (5-inches, halfway between the iPhone and iPhone Plus models) camera placement at the center top as opposed to corner and oval fingerprint reader instead of Apple’s circle. But the rounded edges speaker grill, colors and other design tweaks look way too much like the iPhone. In fact, I’ve mistaken the A9 for my iPhone on a few occasions over the past few days and the A9 is black and my iPhone is white/silver! The iPhone resemblance is a big bummer because HTC has long taken pride in their distinctive, if not overly-heavy, phone designs. Now that that’s out of the way, there are plenty of things to like about the new One A9, including the size as I mentioned before being right in between the two iPhone models. For me, 5 inch screens is the sweet spot, no question. HTC has removed most of everything else around the screen so this is really a svelte phone. The curves feel great in the hand, the buttons are placed perfectly. The power button has a distinct feel so you won’t mistakenly hit it when you are trying to turn up the volume. Speaking of that, HTC definitely took a step back in their speaker department. Instead of the stereo front speakers that HTC pioneered (and others like Motorola took the baton from), here is a solid yet pretty standard bottom facing speaker, which is a disappointment. Initial tests with the camera are excellent, which is great news for HTC because that’s typically an area where they’ve been lacking. Shots are instant, lighting is good and the software is fairly easy to use and understand. The screen is probably my favorite part. a 1080P AMOLED has incredible blacks, and excellent color. It really holds its own against anything else, including again the iPhone in color reproduction. Speed is also excellent across the board including the fingerprint sensor which is almost instant. The downside is of course Sense which makes even the Android 6.0 Marshmallow experience unfamiliar to anyone of the limited number of people who have used HTC at length. HTC will have an unlocked GPE-ish version for sale but I don’t know how much Sense will be on it. I’d reccomend that especially since they’ve promised to have a 15-day upgrade to Nexus level software guarantee. I’ll have a lot more when I get more time on this phone but if my initial thoughts are any indication, I think this will be a popular phone – something HTC desperately needs.